Hello my creative friends & welcome to "My Creative Time!" HAPPY HAPPY NEW YEAR! Can you even BELIEVE it is already 2015??? Well, new year means lots of changes here for us at My Creative Time! We are also welcoming a brand NEW designer….please meet "Miss Brigit Mann! Miss Brigit has guest designed for me & I just fell in love w/her designs & I thought she would be a PERFECT fit here at My Creative Time! Welcome back to all of my designers who have stayed on as well! 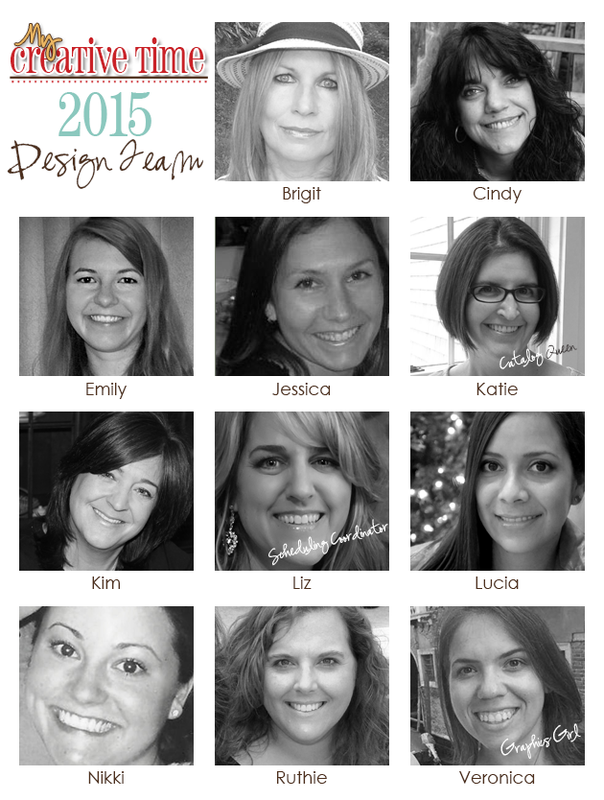 I am THRILLED to work w/all of these SUPER TALENTED designers for an EXCITING 2015! Congratulations ladies! Can't wait to see all the awesome creations you design for 2015! Good Saturday Morning Miss Emma and what a fun way to begin my early morning rise 4:40 a.m.
and just parkin' it with my 1st Kuppa Kuppa and enjoyin' your post and what a fun post it is. So looking forward to what will be happening right here in the New Year. I know for sure you've got lots of fun things planned and so can't wait for Jan. 12 to begin your sneaky peeks so excited. I'm looking 4ward 2 to Monday to begin 2015 with scrapping the Little Things.......so now I'm off to say hi to your DT and leave them some bloggy love. Have a GR8 week-end!! YOU ROCK! Looking forward to an AMAZING year Emma!!!!!! Thank you so so very much for having me,sweet Emma!!!!! I am so happy and excidet!!! Can't wait to be working with you and this fabulous Team!!!! Congratulations Ladies! So super excited for all of you and can't wait to see what you all create in 2015! Great team Emma! I am looking forward to seeing all the wonderful designs from your 2015 team. Thanks for the continued inspiration Emma. Wishing you a fabulous year!! Congrats everyone. Looking forward to all the 2015 fun. Happy New Year...may your business prosper and may YOU Miss Emma and your lovely DT be filled with inspiration as you all work together to make the world a prettier place! Well I finally made it over to blog stalk but let me first start by saying ~ I LOVE being on this team, LOVE what you create, LOVE what you design and LOVE what you stand for! I am so happy to be here and I cant wait to see what the new year has in store for all of us ~ especially with your AMAZING products!!! Thank You for allowing me to be a part of this ~ hugs sweet lady!